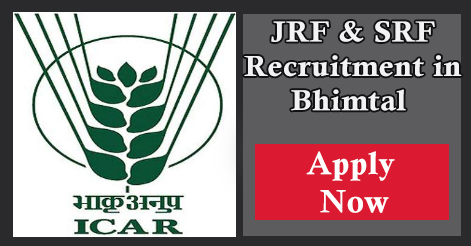 ICAR-Directorate of Coldwater Fisheries Research (DCFR), Bhimtal (Nainital) invites applications for the recruitment of JRF(Junior Research Fellow) & SRF(Senior Research Fellow) at Directorate of Coldwater Fisheries Research, Bhimtal, Nainital, Uttarakhand. Interested candidates may appear in the Walk-in on 29 May 2017. Screening of candidates will be done on the basis of performance in the walk-in interview. Interested and eligible candidates can appear for the walk-in interview on 29 May 2017 to be conducted at the Institute Campus at Bhimtal. The candidates should bring along all the certificates and latest passport size photograph affixed on application containing bio-data and caste certificate should be produced at the time of interview. 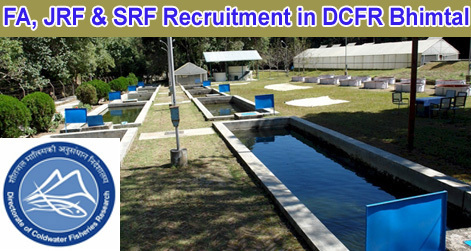 Help us to improve this article/job posting "JRF & SRF Recruitment in DCFR Bhimtal". We would be glad if you can comment below and provide your valuable suggestions and feedback. If this page have any wrong information/list or out of context content, then you can report us as well. How to apply for this post.